My friend Andrew Freimuth once drew a fantastic Dilbert cartoon at a party we had at our apartment. 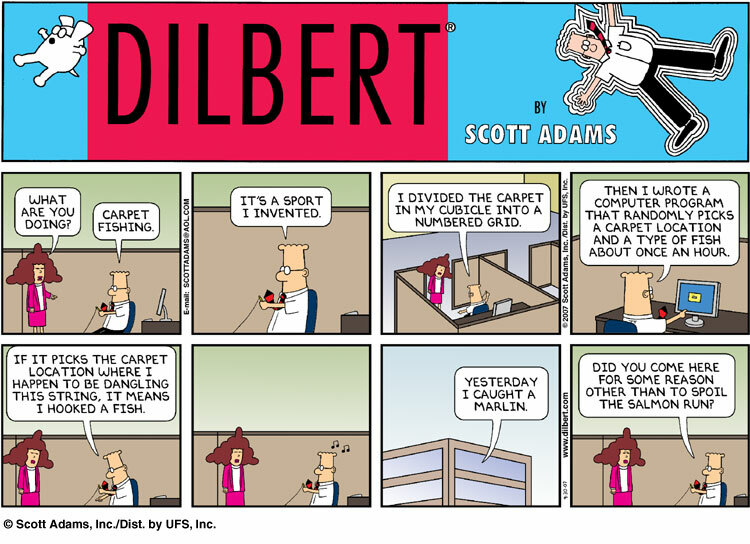 I believe that it beats out many actual Dilbert originals. There is not much new to post tonight. However, there is a new Puddles of Myself Poll up on the sidebar of the page. This poll is brought to you by The Gates, airing Sundays at 10:00 PM on ABC. I have been working hard at a variety of projects as well as killing time in the lunch room at my regular work job. I'm polishing up my manuscript of From Here to the Last Mound of Dirt, as well as drafting sketches to submit to Saturday Night Live (don't ask me how). See, those stupid screen shots we put up on the blog weren't just a threat. We can actually do it. However, later this week we will have a full-time NBA podcast with Paul Sicilian where we break down the NBA Draft and what went wrong in the NBA Finals for the Boston Celtics as well as ramifications for the NBA and NBA legacies going forward. That should be a good one. Also, I will be doing a podcast with Ted Robinson of Forest City. Ted plays guitar and writes some of the shortest and most poignant songs you'll ever hear. Ted and I will hopefully discuss the project that Puddles of Myself and Forest City will be working on together, which is tentatively called "Forest For Yourself: A Tale of Two Bottles". This project will be the presentation of free tracks from the upcoming Forest City album that will be available on this blog. You can follow track by track and then download the whole album. You will also be able to provide a donation. More details will follow in the podcast itself. That is a podcast I am looking forward to very much. I'll also try to get you a column on my thoughts on the NBA (as if you didn't get enough in the most vain Puddles of My Podcast episode to ever be recorded.). And next week I want to explain to you all the glories of Blitzen Trapper, who are one of the most underrated bands playing today. But now, another excerpt of From Here to the Last Mound of Dirt. We have reached Part III of the novel and we now return to the first person perspectives of the O'Donnell family. The funeral and burial are over and now the family members return to their home in order to empty out the house for sale and to return to the problems of their individual lives. No wonder I am trying to write sketches for SNL.